I thought about all this hardware when I spent some time meditating on the reading we hear from the Acts of the Apostles on Tuesday of the Sixth Week of Easter. As Luke tells the tale, Paul and Silas found themselves in a similar predicament. …they threw [Paul and Silas] into prison and instructed the jailer to guard them securely. When he received these instructions, he put them in the innermost cell and secured their feet to a stake. ‘The innermost cell’: Yeah, I’ve been there, along with my Kairos teammates…wondering in my fearful heart how the Holy Spirt could possibly penetrate such mechanisms, among the sturdiest defenses humankind can muster. And: I wondered how a message of Christ’s love and forgiveness might sound to the five men we found there – literally shackled to the floor. So: Just like the jailer in Philippi, we received a great blessing when we put aside our fears and carried the Good News into a supermax in 2012. We saw that, against all odds, Christ’s love mercy can breach even world-class defenses. Thanks for the kind words, Fran…and for those blessed memories of Tamms! 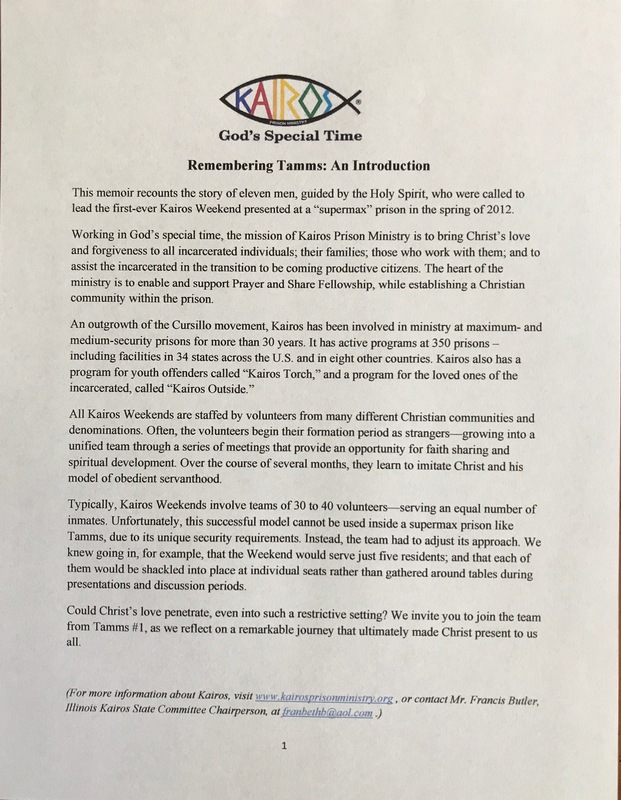 It was a grace-filled period in my life, both the time we spent together in team formation…and the days we spent there in the prison with our Kairos brothers. The Spirit has been good…and generous…to us both!